Synopsis: The grief of the newly captured slaves was overpowered only by the lecherous brutality of their master. From a humble Tswanas Kraal to an opulent South African estate, you will be held captive by Lucia Mann's interweaving stories of loss, cruelty, courage and hope. You will never forget the characters who bring this tale so vividly to life. - Mabali - Who was stolen from the comfort of her ancient homeland and forced to endure decades of agony and ruthlessness. - Nobuntu - who discovered the purity of love in the filth of a slave estate and who would ultimately give birth to zulu kings. - Shiya - The offspring of a white slave child who was forced to suffer the same indignities her mother suffered. - Nigel and Alan Hallworthy - two cruel and callous men who inherited fortune and bought protection from their evil deeds. - Brianna - Shiya's modern day heir who struggled to make sense of a history that was slowly eating away at her. This multi-generational tale takes one on a journey that starts with an encircling rope net; progresses to a filthy stifling slave ship; and ends at a rich slave estate where unthinkable acts take place. The thorny history of the birthplace of slavery comes to life with unforgettable characters yearning for liberty, meaning and justice. Review: This was an excellent read and I just couldn't bring myself to stop reading and put the book down. I am strongly against racism and slavery so it was saddening to read this book. This book outlines the true nature of slavery and how slaves were treated. It was very saddening to read how slaves were treated and that pretty much nobody cared enough to try and help them and that those who did care were disposed of by the rich and it was not investigated. Those who stood up for what was right where killed without there being any consequences. There is a mix of stories throughout this book that all interweave together. I would recommend this book to anyone who likes to read historical accounts of slavery and the cruelty that slaves had to endure. This is a fictional book but the cruelty shown in this book would have been real for people who were actually slaves. This book is factual in how the slaves were treated and abused by their white masters even though the characters are not real. The white masters thought that they were above the law because they were rich and could afford to pay bribes. There are many issues faced in this book such as interracial marriage(which was illegal), racism(which is still as strong today as it was then) and the apartheid which meant that there was a separation between black and white people. I would like to thank Bostick Communications and Lucia Mann for sending me this book for free for review. Bostick Communications is a company that deals with press releases and they send out free books to book reviewers so that the books and authors can gain recognition. 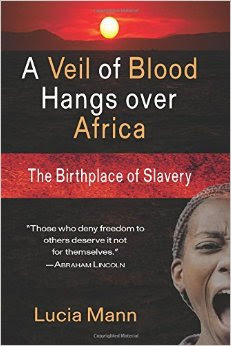 Thank you, Margaret, for your great review of my fourth book: A Veil of Blood Hangs Over Africa. I'm humbled by this and the many reviews that now adorn my praises file. Although my books are classified fictional for obvious reasons, they ARE based on real people and events including myself. I was a victim of slavery in its darkest form and now a PROUD survivor. It was my pleasure to post this review as it was well earned, I am so glad that I got to read this book and it will be part of my treasured collection for years to come. I am so glad that you are a survivor and proud and I am sorry that you had to go through such an horrible ordeal.